If you’d like to catch-up with the story, here are the links to Part 1 is here and Part 2 is here. Please note that this has some adult content and situations. Not safe for work. Yes, this is very different than my normal work. Trying something new. If it’s not your thing, no worries. Regular blog will commence after the next post. I am a romance writer. Being a romance writer (usually) means writing steamy scenes. I aim for at least three solid scenes in a book. I use purplish prose, yes, but not so much that the reader doesn’t know exactly what’s going on. I hadn’t considered that this is a “G” rated site and a steamy scene is a solid PG-13. I can assure you there are lots of steamy scenes in my books. I actually study them in books where I think they are particularly well done to learn. Some pretty enjoyable studying, gotta say. If anyone is interested in the last two scenes, let me know and I can see about getting them to you. 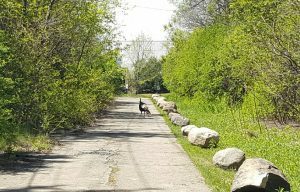 In lieu of this post (and as I race to replace Wednesday’s post), here’s a picture of the turkey that “escorted” me on my walk at lunch today. He normally has four or five female turkeys with him, but they were nowhere to be seen. He did make some turkey noises that sounded nothing like gobbling, and I heard some scrabbling in the woods beside me, so maybe he was warning them about me. Turkeys are much bigger on the walkway in front of you than they are out the window of your car! I think your set the mood and followed through well. It was not something that I expected even after the adult material warning and promise to return to your normal blog after another post. How risque is it? I pulled it. And I will have a different post for Wednesday.